The Janamashtami festival marks the birth of Krishna, the most revered God in Hindu Mythology. The festival of Janmashtmi observes the birthday of Lord Krishna who first appeared in Mathura,India about 5000 years ago Krishna is perceived by most Hindus to be an avatar (incarnation) of Vishnu, who is regarded as the highest avatar. It is believed that all other deities are manifestations of him. Krishna is considered to be a warrior, hero, teacher and philosopher by Hindus. Krishna's birthday is celebrated in the month of Sravana and celebrations are spread over two days. The first day is called Krishan Ashtami or Gokul Ashtami. The second day is known as Kaal ashtami or more popularly Janam Ashtami. For the 48 hour period Hindus are likely to forego sleep and instead sing bhajans, which are traditional Hindu songs. It is believed that Krishna was born at midnight and it is at this time that the true festivities commence. Food is prepared from milk and curds said to have been favoured by Krishna. Some Hindus choose to fast for the first day of Janamashtami, choosing only to eat after the midnight celebrations. 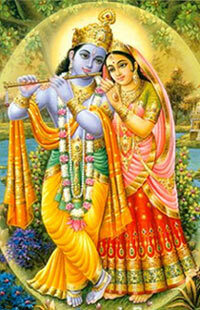 Dances and songs are used to venerate and remember this supreme God. Plays are also carried out re-enacting scenes from Krishna's early life. In Temples images of Krishna are bathed and placed in cradles, whilst the shankh (conch shell) is played and bells are rung. Holy mantras are also chanted to venerate Krishna. Given the significance of Krishna in the Hindu pantheon Janamashtami is celebrated with great importance and consideration all over the country. The temples hold several programmes each trying to out do the other in decorating the deities and the temples. In Janmashtami, the devotees of Krishna stay awake singing bhajans - traditional songs - until midnight, the time it's said the Lord was born. People fast all day and eat only after the midnight birth ceremony. Often the image of the baby Krishna is placed on a cradle with an effigy of a cobra above him. This represents the giant snake that, legend has it, protected him. Priests chant holy mantras and pour special substances from a conch shell onto the idol. These include Gangajal (water from the holy Ganges river), milk, ghee (clarified butter), oil, and honey. Midnight prayers, hymns and religious songs are performed to celebrate the god. Legend tells how Krishna was born in an extraordinary way and live an equally extraordinary life. At the time of his birth, Krishna's parents Devaki and Vasudevm, were imprisioned by Devaki's evil brother Kansha. He kept them under lock and key because, it had been foretold, the eighth son of his sister would kill him and Kansha wanted to ensure all the babies were slayed as soon as they were born to protect himself. The evil Kansha killed his sister's seven children one by one but when Krishna was born, divine intervention saved his life. # Krishna, who came to the world to rid it of all evil, was born on a dark rainy night at midnight. #The guards had miraculously fallen into such a deep sleep they did not know he had been born and so could not tell the king - sparing his life. #The father whisked the baby to Gokul and to safety, helped by a number of miraculous events on the journey. #Obstacles cleared from their way but, most miraculous of all, they were protected by a giant snake called the Adisesha. #Krishna grew up peacefully in Gokul. Even as a child he performed several miracles and his exploits are now the immortal legends of Braj. #He killed a number of asuras, vanquished the Kali Nag and later on he killed King Kansha too, fulfilling the prophesy and ending his evil reign.